Panaji : To enable vigilant citizens to report a law or traffic violation, Goa police has launched a mobile app. 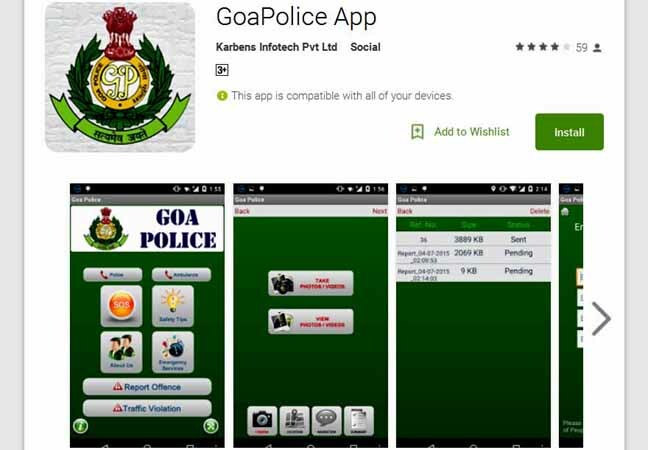 The app available for now on Android and iOS platforms, provides for reporting law and traffic violations via video and photos straight to the police department, enabling initiation of action immediately, a Goa police statement said. "The 'report offence' and 'traffic violation' keys are functionalities that enable the user to capture and report offences and traffic violations in a structured manner. If a user at any time witnesses anyone breaking the law or any irregularities within the state, the user can compile a report comprising an image or video evidence of the offence," the statement said. "In addition, the user can record a narration of the events, and add the locational details of the offence. All this can be done in offline mode and saved for further alteration or can be directly sent to Goa police for processing," it further said. The app, which can be searched on Play Store or on iPhone Apps using 'GoaPolice App' as a search code, also has an SOS button in case of emergencies, which immediately calls a saved number with a single click. "SOS is a key functionality in times of emergency. Once the SOS button is clicked, it will try and get the users GPS co-ordinates and send this information along with a message requesting for help to all contacts saved in the 'Emergency Contact Numbers' page," it said, adding the police control room service as well as medical emergency response unit can also be contacted via the app. The app have an information about it on Google Play Store that, "The Goa Police application is a public benefit application aimed at helping citizens reach out for instant help in times of emergency, easily access Goa Police, and to add to the overall vigilance in the state." Further more saying, "The application helps the user to stay informed with all information about Goa Police, its structure and its various departments, traffic offences and the associated penalties, and to capture and report to the Police various offences witnessed." "An offence once reported can further be tracked and followed up with the Police Force via the reference ID assigned to it. Through this application, Goa Police will help you stay updated on critical events in the state through their live notification feature."